Okay, you finally made the decision. You’ve been putting it off because, well, you really don’t need one, but you want one. What is this big decision, you ask? 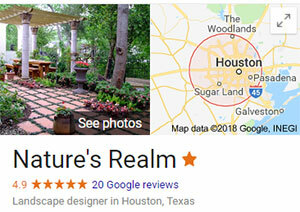 Picking out a good tree for your yard. …you’ve got questions. How big will it grow? How long will it take? What color will it get? Does it keep green all year or turn into a zombie over the winter? Here are some questions you must first ask yourself. To start, if you know a little about trees, then what type of tree are you looking for? 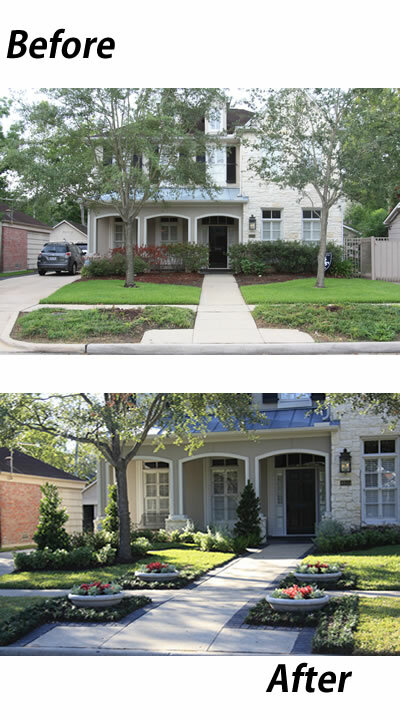 If you’re looking for trees for Houston, read this linked to list I have on our site. Ask Yourself Why You Want a Tree? Think of the location you wish to place the tree and also consider the reasoning of placing the tree there. Is it for much needed shade and/or privacy? It may be best choosing a fast growing evergreen tree. Is it to add color to a dull area? Consider a flowering tree. 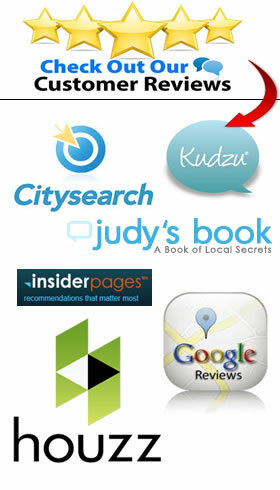 Are you looking for something that will place food on the table? Fruit trees will do that. Remember that deciduous trees will shed their leaves, are you willing to rake? Be aware of the height that the tree will reach at maturity and note any power lines or utility lines that it may interfere with. Shallow rooted trees should be planted in areas where they are protected from strong winds and trees with very large, invasive root systems should be planted away from underground piping or wiring. With proper advance planning, you can avoid lots of troubles in the future. 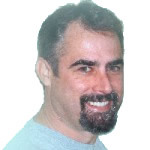 For more on what things like “balled” and “burlapped” trees are, check out my article on plant selection and maintenance. 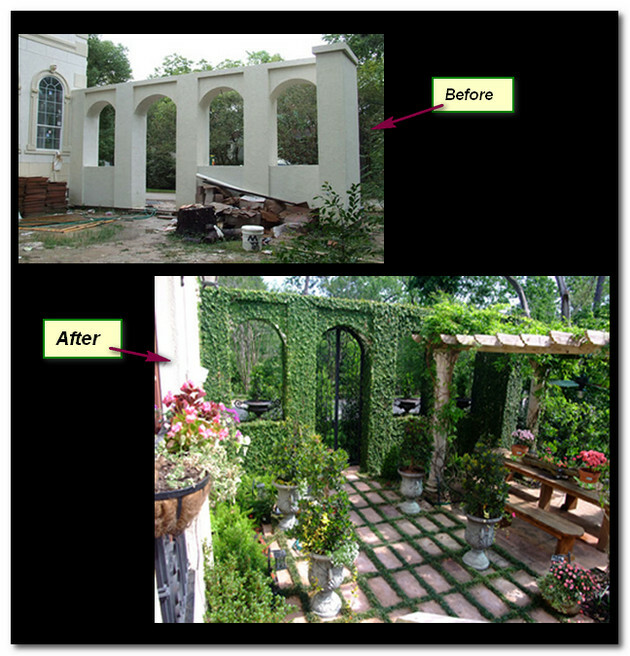 Try to avoid purchasing bare rooted trees; they are commonly damaged and require extensive care when first planted. If you must, inspect the tree thoroughly and see that the roots were kept moist. One way to check this is to bend the small to medium sized roots- they should be soft and flexible. Avoid planting bare rooted trees in the summer and winter. 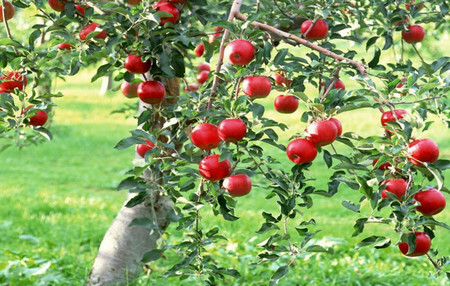 Opt for the fall or spring, especially if the specimen has no leaves at the time of planting. 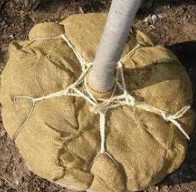 Balled and burlapped trees, check that the root ball is secure, moist and that the plant doesn’t move around in it’s sack. There should be ten inches of sack for every inch of the trunk diameter. Before planting, remove as much of the burlap as possible. If the tree id also coated with wire, carefully remove that as well. 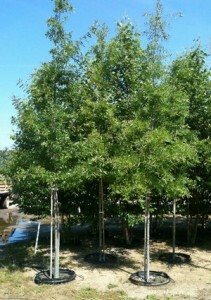 Container trees are, in my opinion, the most recommended for homeowners. They tend to be simple to plant, and are least likely to be damaged in transport. 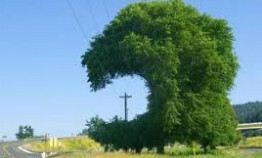 On occasion, you may have a tree whose roots have begun to encircle the base of its container. If this happens to you, try to unravel the roots as best as possible. If this is unsuccessful, gently prune the roots, and trimming the top of the tree in proportion to the roots that were pruned. 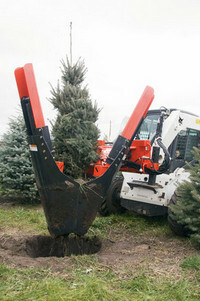 This method entails choosing a field grown tree and the tree is removed, transported and placed in your yard where a machine has already prepared a properly sized hole. If you opt for a machine dug specimen, make sure that your yard can permit access to the large machinery used in this method It is extremely successful when done properly. Drainage is extremely important, in soggy soils the tree should be planted higher than the existing grade. (1-2 inches) above the soil line. The width of the hole should be several inches wider than the root ball. 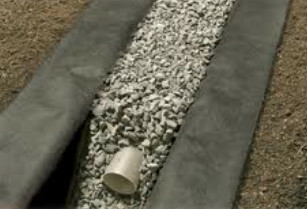 In heavy clay soils, a french drain should be constructed. In a French drain an additional hole is dug to the planting site. This hole is dug at where the center of the root ball would be. 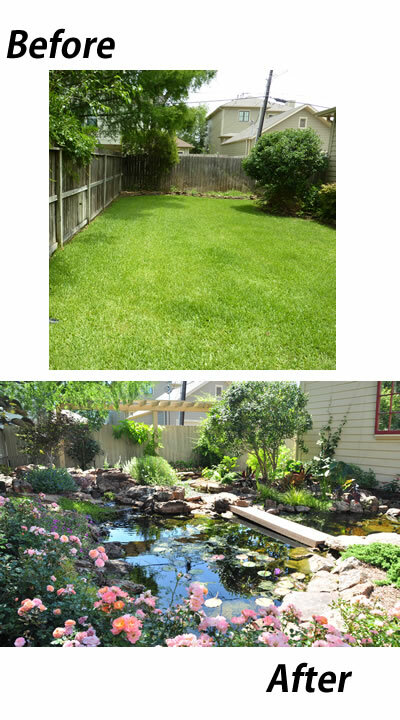 Depending on the size of the tree, it should be 4-6″ wide and 12-18″ deep. It is then filled with gravel and capped with a layer of fiberglass insulation. In heavy clay, two thirds of the soil should be removed and back filled with one third sandy loam that has been mixed with organic humus. 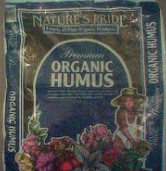 Why organic humus, you ask? Composted organic matter absorbs water. The resulting breakdown is humus. The humus then holds the water really well. That’s a very short answer which probably leaves you with more questions than before. Just Google it for more information as a detailed explanation of organic humus is a bit beyond the scope of this article. When watering freshly planted trees, a good measure is to set a hose 6-8″ into the back-filled area and thoroughly saturate to eliminate any air pockets. After watering, fill the hole completely to the top of the tree ball. 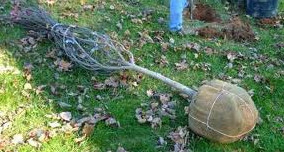 Be careful to not place too much soil on top of the root ball, as not to suffocate the tree. The soil moisture level around new trees should be monitored daily, fertilizing should not take place in the first season if the trees were bare rot or balled and burlapped. If they were container grown, a 20-20-20 or 23-19-17 at the rate of 1 and 1/2 ounces per 100 gallons of water is sufficient. 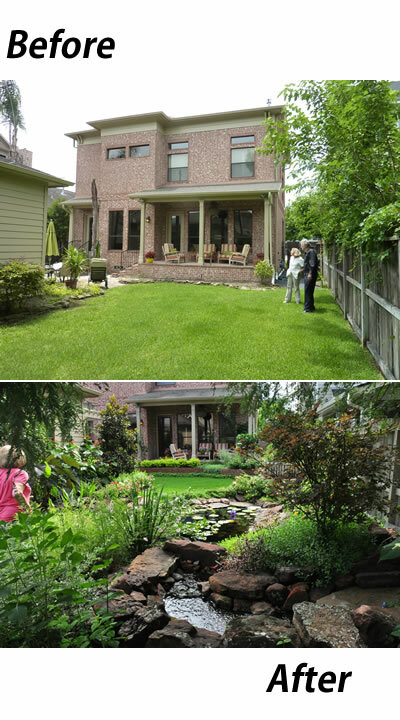 When it comes to selecting plants for your landscape design, being an educated consumer will help save time and money. Learning a few basic plant selection tips will ensure that your investment will last for years to come. 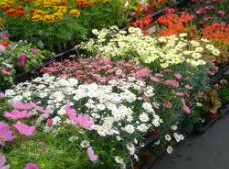 bedding plants – small plants that are sold in small plastic pots or trays. bare rooted plants – are usually sold in the late winter and early spring- common varieties are pecan trees and rosebushes. With each variety special care in planting will assist you in ensuring your plant will transplant from nursery to yard without any casualties. For bedding plants, water the pot or tray thoroughly before planting. 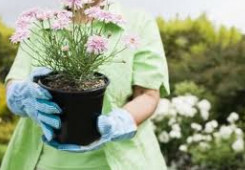 Don’t attempt to simply pluck the plant from its pot, instead grasp the plant between your thumb and index finger, while turning the pot upside down. Gently tap the bottom of the pot until the plant is released. If the plants are in a tray, simply squeeze the base of each cell of the tray ant the plant will release. When planting container plants, first determine if it is in a plastic or decomposable container. For plastic containers, use the same method for bedding plants as noted previously. If the plant is in a decomposable, pressed cell container- simple place it in the ground, but trimming the lip of the container helps to improve water penetration from the soil line. In some cases, you may come across a plant that is in a tin container or other vessel that is challenging to remove. In such cases the nursery may remove it for you, but if that’s not possible cutting the container on each side is the best method, be sure to use caution and wear heavy gloves whenever cutting any type of metal. Balled or burlapped plants need to be handled gently, never lift the specimen by the trunk or stem; instead, carry it by the ball. Planting techniques are very similar to container plants. Planting bare rooted plants require trimming of the roots so that they are uniform in length. Soak the roots in rainwater (if available) overnight. When planting, be sure not to over pack the roots in, fill the area gently with soil and water thoroughly. Watch closely, and respond to the plants needs promptly.